Representatives from the United Nations and the United States Congress as well as other dignitaries joined 10,000 Scientologists and their guests to commemorate the opening of New York’s Church of Scientology on September 26, 2004. 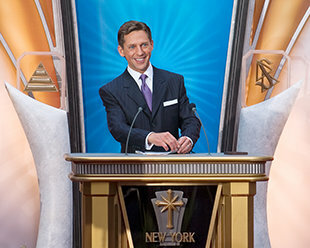 Mr. David Miscavige, Chairman of the Board Religious Technology Center and ecclesiastical leader of the Scientology religion, officiated at the opening of the Church of Scientology New York. Immediately following the ribbon cutting for the Church of Scientology New York guests stepped through its doorways for a first look at the Big Apple’s new Church. The Church of Scientology in New York City, located just off Times Square, was a gift from the International Association of Scientologists to the people of New York in recognition of their courage and spirit in the face of the 2001 World Trade Center disaster. Mr. David Miscavige dedicated the building. He was joined by United States Congressman Charles Rangel, United Nations Undersecretary Maurice Strong, and Vice President of the Times Square Alliance, Mr. Bob Esposito. “As we look out across the world, we can speak of international conflict, of economic instability, and yes, of terrorism. But if we do, my friends, let us not speak in terms of those problems. Let us speak in terms of solutions, solutions that can solve every one of them. “This Church represents the work and help all of us must continue to bring, in achieving the full measure of our aims. For here is the Ideal Organization from which to bring all of our programs, all of our tech, literally everywhere. “So yes, this is just the start. And that is why I say today is when the real work begins. “For this is more than just a home for you, the Scientologists of New York. "It is also a home for the broader community where all men and women of goodwill are welcome, and who we dedicate ourselves to helping each and every one.